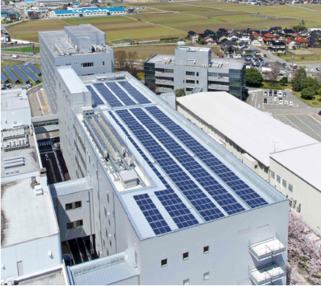 We are now using solar panels at our headquarters in Japan to produce clean, renewable energy. EIZO's global headquarters are in Hakusan, Japan - an area abundant in nature. To the west is the Sea of Japan and to the east the picturesque Hakusan mountain range. Surrounding our headquarters are hundreds of acres of fields producing rice, Japan's staple crop. To preserve the natural environment surrounding us, we are taking steps to reduce CO2 emmissions. One way we are addressing this is by turning to renewable energy resources. We installed have 715 rooftop 180 kW solar panels on our new factory which began operation in 2016. Nearby at ground level we have another 1,014 250 kW solar panels. The annual output of the solar panels is 373,000 kWh. This represents a reduction in carbon dioxide emissions equivalent to 239 tons/year.